SAN FRANCISCO—If Google’s Chromebook is the next big thing, Intel wants to make sure that Intel is Inside. On Tuesday, a number of manufacturers announced plans to build low-cost netbooks around the mobile version of Intel’s “Bay Trail” Atom chip, the Bay Trail-M. Lenovo’s new N20p was probably the highest-profile offering, but the other hardware makers including Acer, Asus, and Toshiba also announced their own plans. The new Bay Trail-M chip will carry the “Celeron” brand name, the brand that Intel has historically associated with low-priced, entry-level computing. Intel also said that several Chromebooks would be built around its low-end Core microprocessor, the Core i3. Interestingly, Intel also said it will be the only processor vendor to support a 64-bit version of Google’s Chrome OS. To date, a number of Chromebooks have been built around ARM chips, including the Exynos processor that Samsung, one of the early Chromebook vendors, manufactures for its own use in Chromebooks and smartphones. Intel executives said that twenty Chromebook designs in 2014 will be based around its chips, up from just four designs in late 2013. Intel’s strategy is to ensure if there is a computing device, it work best with Intel’s processors, said Navin Shenoy, an Intel vice president and general manager for Mobile Client Platforms. “We will embrace multiple operating system and and we want our processors to work best with [them],” he said. 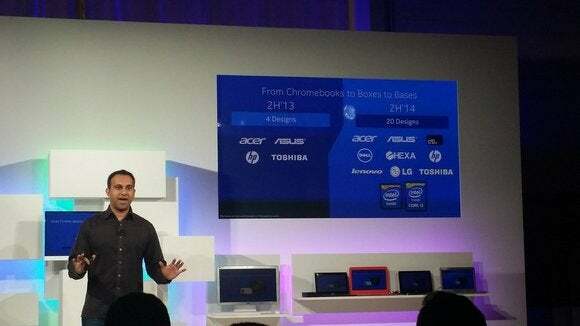 Navin Shenoy, an Intel vice president, describes how Chromebooks will increasingly use Intel's processors. Intel executives claimed that the new Chromebooks powered by its Bay Trail-M chips will deliver up to 11 hours of battery life. The new Chromebooks with the “updated” Celeron Bay Trail chips will all include 802.11ac Wi-Fi, the company said. Shenoy added that the new Bay Trail chips will run 4 times faster than “alternative” architectures on Web apps, and three times faster on Chrome OS apps like QuickOffice. Acer's new 13.3 C300 Chromebook uses the Intel Bay Trail-M chip. Caesar Sangupta, a Google product director, said that at Amazon, seven of the top twenty notebooks are Chromebooks, and the top six notebooks with the highest ratings by users are all Chromebooks. 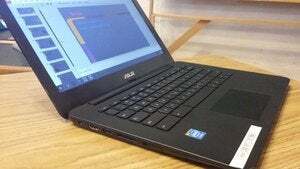 Thousands of schools—over 10,000—have bought Chromebooks, up from 2,000 in September, he said. Google users will be able to watch Google Play movies offline in the next few weeks, through the Google Play app on Chrome OS, Sangupta said, as well as Google Docs. 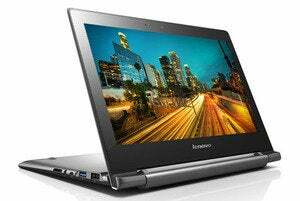 Lenovo already manufactures a pair of Chromebooks: the ThinkPad 11e Chromebook as well as the ThinkPad Yoga 11e. (The Lenovo ThinkPad Yoga, a ruggedized Chromebook designed for education, will run on Bay Trail, Intel said.) On Tuesday, the company announced two more. Lenovo’s new N20p Chromebook offers two distinct advantages. First, its 11.6-inch display is a 10-point touchscreen. Second, the N20p borrows a trick from its Yoga cousins: Its hinge can rotate up to 300 degrees, so you can prop up the Chromebook in a standing position. It’s generally been difficult to get excited about the small, cheap 11-inch Chromebooks that crowd the market. Lenovo's second new Chromebook, the baseline N20, has no touchscreen and no 300-degree hinge, so it's closer to typical for the class. It will start selling for $279 in July. The N20p will start selling for $329 in August. 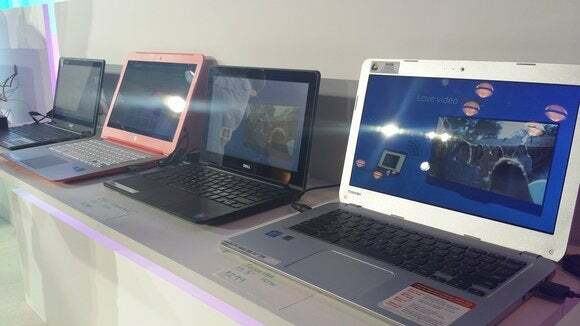 Intel also said it would design a version of its reference netbook platform for education, now powered by Chrome and its Bay Trail chip. 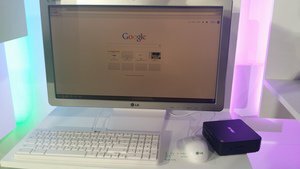 The LG Chromebase all-in-one Chromebox. Asus announced the 11.6-inch C200 and the 13.3-inch C300, which will begin shipping this summer for an undisclosed price. Acer also announced its first Chromebook based on the Bay Trail-M chip. It will be available later this year. A second class of Chromebooks will also run on the Core i3, with devices that will be priced at about $349 or so, Shenoy said. Acer and Dell will be two manufacturers that will update their Chromebook lines with new Core i3 chips, he said: Dell with a Core i3 revision of the Chromebook 11, and Acer with a new Chromebook C720. Dell didn’t announce pricing, although Acer said its Chromebook would be priced at $349. The LG Chromebase (22CV241), the first “all in one” Chrome-based desktop, first launched at CES 2014. Shenoy said the Chromebase will ship on May 26 from a variety of retailers, for $349. Moving forward, it's not clear how hardware makers plan to differentiate themselves. Google's Sangupta referred to a "common experience" across designs, and Intel is obviously encouraging hardware vendors both to include the same chips and price their Chromebooks at identical levels. Neil Raggio, the marketing director of Chrome products at Dell, said Dell would create unique products through a combination of hardware, software, and the "fit in the hand." "Saying that if you have the same softwatre you have a commodity product is oversimplifying it a bit," Sangupta added. "The product is a hardware, the software, the overall experience. Even just having a good keyboard versus a bad keyboard can mean a huge consumer experience." Bob O'Donnell, principal analyst at TECHanalysis Research, said he thinks eventually Chromebook makers will be forced to begin adding touch capabilities,given the growing number of touch-aware apps. "All in all, I thought it a pretty impressive showing," O'Donnell said of the Intel event. "It's a wide range of products, some pretty impressive vendors a number of interesting form factors. They're clearly serious about it." Updated at 12:50 PM with comments from Bob O'Donnell and additional pictures of some of the Chromebooks. This story has also been corrected to note that the current version of Chrome is a 64-bit OS. Updated May 7 with a video report from IDG News Service.